Is the "thin blue line" eroding in America's Finest City? 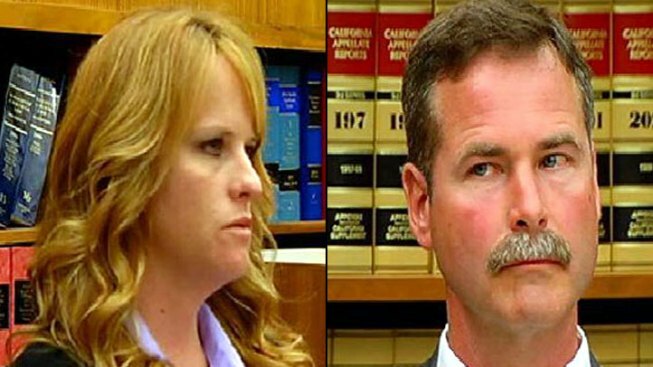 Officer Robin Hayes (L) shared intimate details of her relationship with Sgt. Ken Davis during a preliminary hearing Wednesday. A San Diego police officer testified in a downtown courtroom how a former colleague, a San Diego police sergeant, stalked her and threatened to kill her. SDPD Sgt. Ken Davis sat in court Wednesday as prosecutors presented their case against him in a preliminary hearing. The complaint alleges that Davis followed and harassed the female officer from late June until early September of last year, and harassed her by phone at least five times in early August. The alleged stalking victim, Officer Robin Hayes, testified that during one meeting, she pulled out her gun to protect herself, fearful that Davis would hurt her. Hayes detailed her relationship with the defendant, explaining how the two stopped a sexual relationship in January 2010 but kept in contact for months after, meeting for a walk, a lunch and a dinner and sharing a kiss in her home during that time. 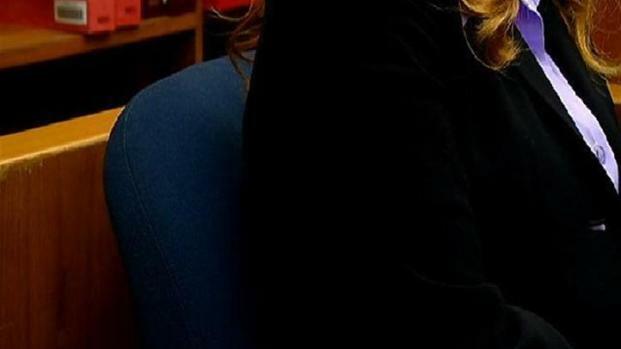 A San Diego police officer testified in a downtown courtroom how a former colleague, a San Diego police sergeant, stalked her and threatened to kill her. Here, she explained why she didn't call 911 when Sgt. Ken Davis appeared at her home after she rekindled a relationship with an ex. “I told him ‘I don’t want him to be confused and I don’t want to talk any more and I need to focus on my children and my job and my career,’” she testified. A few weeks later, Davis sent a letter to Hayes’ mother in which he said he was “obsessed with her,” according to testimony. Through text messages in August, Davis demanded she speak to him and accused her of wrecking his marriage, Hayes testified. It was after these text messages that Hayes said she began to fear Davis. 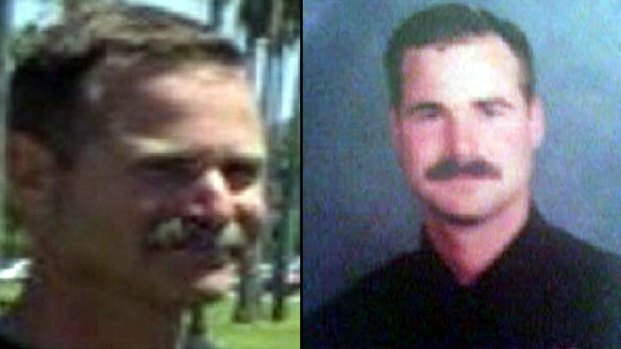 A veteran San Diego police sergeant is accused of stalking and harassing a fellow officer. Sgt. Ken Davis was formally charged in February with felony stalking and three misdemeanor charges of repeated harassment. According to a source, Davis's alleged victim is a female police officer who had to be moved to a "safe house" after Davis threatened to kill her when their romance went bad. Davis pleaded not guilty to the charges and was not required to post bail while he waits for trial. Then on August 7, 2010, when she was working with the Mid-City Division, Hayes returned to the station between 1:15 a.m. and 1:20 a.m. to use the restroom and to fuel up at the police gas station. She said she spotted Davis, who was not scheduled to be working with that division, inside another police car fueling up at the same time. With her voice quivering, Hayes testified that she took the gun out of her holster and held it at her hip. She told the court she felt scared because she wasn’t sure what he was going to do. During a short conversation, Davis told Hayes that he had left a bag on her chair, she said. Inside the bag, she found a pair of her sandals, a pair of her underwear, a watch she had given Davis as a gift, a T-shirt she had given him as a gift and another sentimental item. She testified that she reported the incident to a co-worker immediately. In cross-examination, Davis’ attorney raised questions about whether Hayes was really scared that night. He also questioned her memory of the evening, asking her why she didn’t leave the area immediately once she spotted Davis at the gas station. Other officers were present in a show of support for the accused sergeant. A former Police Officers Association president was also in court, observing the hearing against Davis. Davis was formally charged in February with one felony and three misdemeanor charges: felony stalking and repeated harassing by phone or electronic contact. Davis pleaded not guilty, and the judge has allowed him to remain free on his own recognizance, meaning he was not required to post any bail. Davis was also ordered to surrender any firearms that he owns or has control over. A police department public affairs officer confirmed Wednesday that Davis is on "paid administrative duty" and will continue to work for the department while it investigates the allegations against him. Court documents obtained by NBCSanDiego show that Davis works at the department's Southeastern Division, located on Skyline Drive.